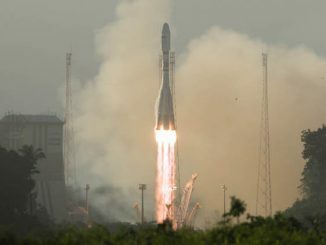 A Soyuz rocket took off from French Guiana on Thursday with the SES 15 communications satellite, a craft heading for an orbit more than 22,000 miles over the equator to provide airborne wifi and aeronautical navigation services over the United States. 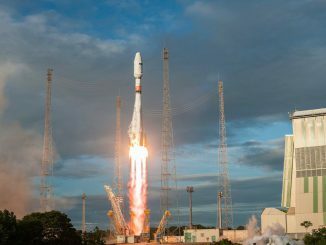 Five satellites rode a Soyuz booster into orbit Monday from French Guiana, and these spectacular photos from Europe’s tropical spaceport show the legendary rocket’s fiery departure from the edge of the lush Amazon jungle. 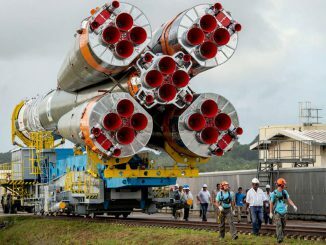 A Russian Soyuz rocket fired off a launch pad in French Guiana Monday evening with satellite missions to monitor Earth’s environment, test Einstein’s theory of general relativity, and inspire the next generation of space engineers. 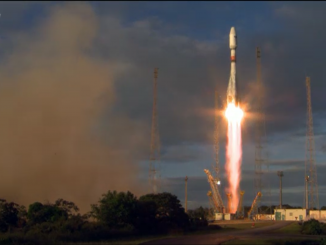 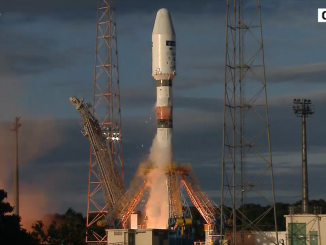 A Russian-made Soyuz rocket was launched from Europe’s space base in French Guiana on Monday at 2102 GMT (6:02 p.m. local; 5:02 p.m. EDT) with the Sentinel 1B environmental satellite. 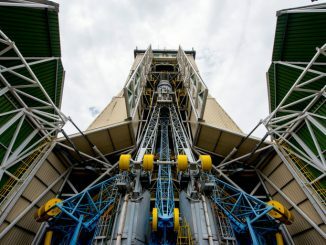 Russian rocket technicians planned to swap out a failed inertial measurement unit inside a Soyuz rocket overnight Sunday after a failure in the navigation system forced officials to abort the booster’s planned launch of five satellites from French Guiana. 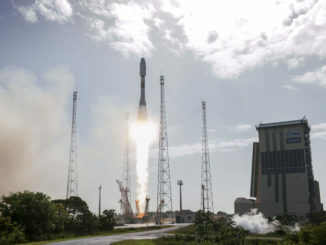 After replacing a faulty inertial measurement system blamed for a scrubbed launch attempt Sunday, a Soyuz rocket headed to space from French Guiana today with five satellites, including the next spacecraft for Europe’s multibillion-dollar Earth observing network and a French experiment to probe the validity of Einstein’s theory of general relativity. 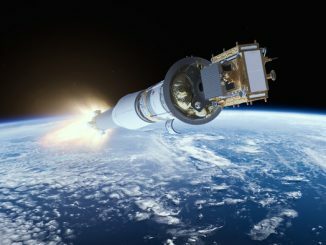 The term “direct flight” will go to new heights Friday with a four-hour flight by a Soyuz rocket and its Fregat upper stage to deliver five satellites to three distinct orbital destinations hundreds of miles above Earth. 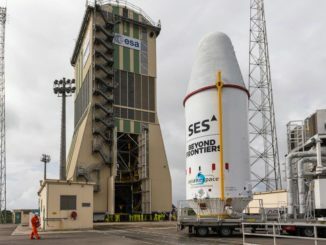 Five European satellites packaged inside an aerodynamic fairing have joined a Soyuz rocket its launch pad in the French Guiana jungle for a roaring ride into orbit Friday.